When pollution is bad, we have to be more informed about the problem in advance and promote programs that avoid, improve, shift – just the way fuel is burnt in the city. For severe and emergency conditions, with concentrations above 300 μg/m3 for PM2.5 and 500 μg/m3 for PM10 for more than 48 hours, actions include closing entry of non-commodity trucks, closing all construction, introduction of odd-even and additional measures as the authority’s see fit. The action plan has been put in place with good intensions. However, it is still a defensive one with many inexplicable ends. For example, who is going to take charge of implementing these measures in a short turnaround time, with several agencies listed against each of the measures? Shutting down power plants and keeping an eye on landfills are easy – but how are we going to shut down 1,000 brick kilns within a 40-km radius of the city? What does it mean to intensify public transport when the Delhi’s minister of transport has declared there won’t be any new buses to support this action plan or during future odd-even instances? How do we keep vigil on more than six million cars and motorcycles in NCR, with a small fraction of traffic police on more than 25,000 km of roads? Moreover, the decision process is very retroactive. The Central Pollution Control Board (CPCB), the Delhi Pollution Control Committee (DPCC) and the Indian Meteorological Department (IMD) are responsible for keeping tabs on air quality and will accordingly process data to inform EPCA of the air quality status. The EPCA in turn will formulate the possible line of measures and convey them to the respective authorities, who will then discuss them internally to figure out the course of action. All this could take anywhere from two to three days (optimistic) before there is action on the ground. A lot can change in 48 hours, including meteorology: sometimes the weather disperses pollutants more. 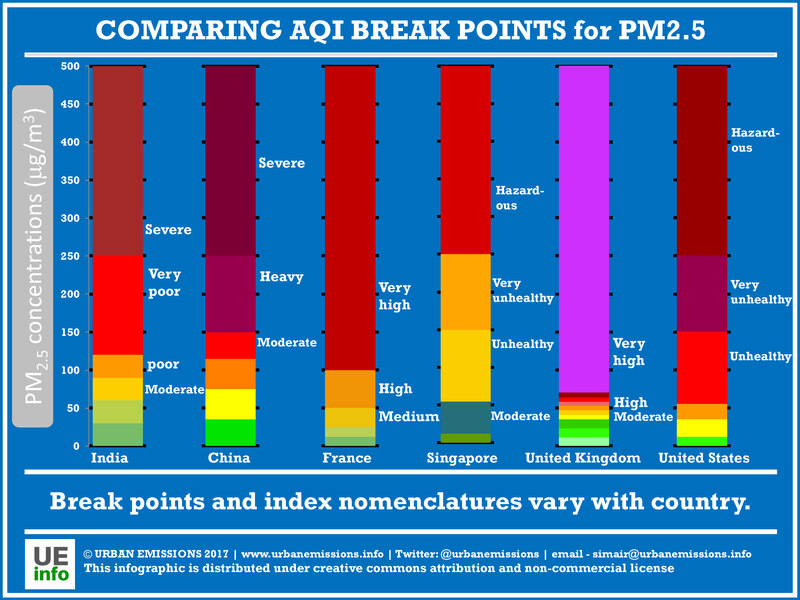 The air quality index method is very misleading since every country has its own scale. The ranges at which Paris and London evoked emergency plan are very stringent compared to India’s. The highest alert comes at 100 μg/m3 of PM2.5 for Paris and 70 μg/m3 for London, both of which fall in the transition period of moderate to poor for Indian cities. In other words, this is the range we might call, “not good but okay” while the world’s cities are in panic mode. Both Paris and London host state-of-the-art air pollution forecasting platforms, which means they anticipate the high, very high and severe pollution levels at least 48 hours in advance. The most recent red alert issued for eight London boroughs came on January 20, with pollution likely blowing in from Germany. An alert is issued so that precautionary measures can be installed to ensure that the levels are either not reached at all or cut down the anticipated share of severity. Which means the problem is tackled head-on at least 48 hours in advance. The advance notification system is also supported by a wide network of monitoring stations – more than 60 reporting live at airparif and over 110 reporting live at londonair. We know by now that air pollution is not a standalone problem in a city but is essentially a symptom of inadequate planning. Policymakers can implement one-off solutions against air pollution but the best short-term results are possible only when they are fully implemented with no exemptions. One example is Beijing during the 2008 Olympics. Based on satellite observations, and during the two months when stringent restrictions were in place, the levels of nitrogen dioxide resulting from fossil fuel combustion plunged nearly 50% and the levels of carbon monoxide fell by almost 20%. The measures were good at quickly lowering the pollution but since they weren’t addressing the root problem, they could do nothing once the stay order was lifted. The battle against air pollution in Beijing recently led to an announcement of ‘anti-smog police force‘ and an expenditure of $2.6 billion to bring back clear sky days to the city. The measures introduced in Beijing have become somewhat of landmark examples to achieve quick mitigations. These include a 50% cap on vehicles everyday based on the registrations, full support from the public transport sector, shutdown of industries and power plants within a radius of 100 km for at least a month before the games began and a strict enforcement of a ban on burning coal and biomass for cooking and heating. It was a matter of national pride; every citizen in the city chipped in to make sure the sky was blue and the air was clear. The most talked about scenario is the 50% cap – a.k.a. the odd-even program. Key features that led to the program’s success were limiting the exemptions to emergency vehicles, thousands of number plate recognition cameras to aide traffic police and a wide network of railways and roads to take on the additional load. This was a proactive measure, knowing that air quality during the games would be bad but had to be better. In 2016, the Delhi government played with the odd-even theme twice, for two weeks each in January and April, with a lot of exemptions and even a temporary increase in public transport capacity. Neither pilot pointed to a clear reduction in pollution. The reasons are plenty: the share of pollution from other sources is equally significant; the prevalent weather brought down pollution from the fires in Uttarakhand and there is limited information to statistically argue for success. General reports showed lesser congestion, faster speeds on the road and 13% more daily revenue for the Delhi Transport Corporation. In December, 2016, Paris also implemented an odd-even program, in advance, due to an anticipated red alert for the city, and to make the program a success, made all public transport modes free. Their biggest advantage is that transport is their only big source of pollution in the city, followed by coal and wood burning for heating purposes, which means cutting down the traffic by 50% and a wide media campaign to alert people to not burn coal or wood, but use electricity for heating, gives them immediate benefits. A proactive pollution alert system must be in place that will allow EPCA to notify agencies responsible for implementing GRAP at least 48 hours in advance. This goes hand in glove with the previous point – more informed we are about the problem, the more able we will be in avoiding it. Sarath Guttikunda is the director of Urban Emissions (India), an independent research group on air pollution that disseminates air quality forecasts for 640 districts in India.